Reading and share top 94 famous quotes and sayings about September 11 by famous authors and people. 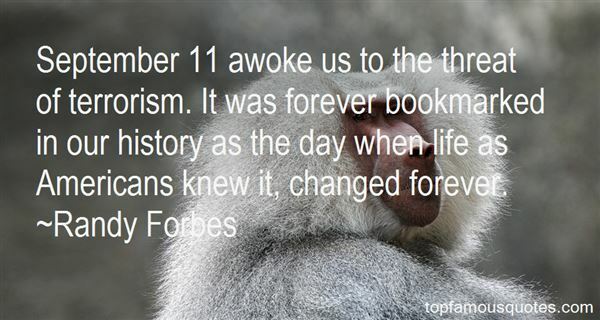 Browse top 94 famous quotes and sayings about September 11 by most favorite authors. 1. "What led to September 11 is that most decision makers in the White House thought like you. They supported despotic regimes in the Middle East to multiply the profits of oil and arms companies, and armed violence escalated and reached our shores." 2. "And then, on September 11, the world fractured.It's beyond my skill as a writer to capture that day and the days that would follow--the planes, like specters, vanishing into steel and glass; the slow-motion cascade of the towers crumbling into themselves; the ash-covered figures wandering the streets; the anguish and the fear. Nor do I pretend to understand the stark nihilism that drove the terrorists that day and that drives their brethren still. My powers of empathy, my ability to reach into another's heart, cannot penetrate the blank stares of those would murder innocents with abstract, serene satisfaction." 3. "I am certain that I speak on behalf of my entire nation when I say: September 11th we are all Americans - in grief, as in defiance." 4. "September 11 impressed upon us that life is a precious gift. Every life has a purpose. And I think we all have a duty to devote at least a small portion of our daily lives to ensuring that neither America nor the world ever forgets September 11." 5. "Whether we knew many who died on September 11 or personally knew none, we all lost something on that day. Innocence. Security. A trust that our homeland would always be safe." 6. "In the aftermath of September 11th, it is critical to secure our borders." 7. "Legislation passed in the aftermath of September 11, 2001 enhanced our intelligence capabilities and strengthened our national defense, but until now our nation's immigration policies have not adapted to the needs of a post-September 11th world." 8. 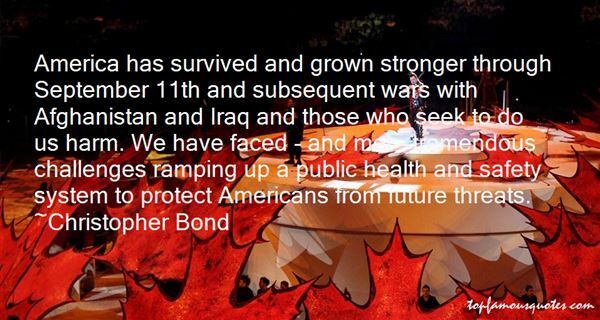 "America has survived and grown stronger through September 11th and subsequent wars with Afghanistan and Iraq and those who seek to do us harm. We have faced - and met - tremendous challenges ramping up a public health and safety system to protect Americans from future threats." 9. "Then all at once our personal and political quarrels were made very abruptly to converge. In the special edition of the London Review of Books published to mark the events of September 11, 2001, Edward painted a picture of an almost fascist America where Arab and Muslim citizens were being daily terrorized by pogroms, these being instigated by men like Paul Wolfowitz who had talked of 'ending' the regimes that sheltered Al Quaeda. Again, I could hardly credit that these sentences were being produced by a cultured person, let alone printed by a civilized publication." 10. "Some readers may have noticed an icy little missive from Noam Chomsky ["Letters," December 3], repudiating the very idea that he and I had disagreed on the "roots" of September 11. I rush to agree. Here is what he told his audience at MIT on October 11:I'll talk about the situation in Afghanistan.... Looks like what's happening is some sort of silent genocide.... It indicates that whatever, what will happen we don't know, but plans are being made and programs implemented on the assumption that they may lead to the death of several million people in the next—in the next couple of weeks.... very casually with no comment.... we are in the midst of apparently trying to murder three or four million people.Clever of him to have spotted that (his favorite put-down is the preface 'Turning to the facts...') and brave of him to have taken such a lonely position. As he rightly insists, our disagreements are not really political." 11. "On September 11, the murders of World Trade Center employees and visitors took the lives of numerous nationalities, ethnic groups and religious followers." 12. "Certainly, the murder of civilians for political statement did not just begin on September 11, 2001." 13. "And here we are, so different from who we were on September 10th. And also different from who we were on the 11th. And the 12th. And yesterday. Sometimes you see the before/after. And sometimes it's as soft as saying hello." 14. "In remembering those who lost their lives in the London attacks and the September 11th attacks we continue our commitment to fighting for freedom, democracy and justice." 15. "To win the war on terror, we must know who our friends are and where our enemies are hiding. We can't continue fighting terrorism using the same foreign policy blueprints that were in place before September 11th." 16. "From a Christian point of view of course we do want a peaceful world, and I think September 11 did actually make people aware not only of vulnerability and how transitory life is, but there are forces of good and honor and justice which speak to us of God and his love for us." 17. "I think what has happened, actually, is that September 11 has given a spur, a renewed urgency, to dialogue between the great faiths." 18. "September 11, 2001, revealed heroism in ordinary people who might have gone through their lives never called upon to demonstrate the extent of their courage." 19. "Before September 11, we were fighting terrorism in our southwestern Philippines, and it was a lonely fight. However, we were able to contain it now in one island in that part of the Philippines. But after September 11, and after the creation of the global coalition against terrorism, now we have allies, and I believe now it will easier with allies." 20. "I glance at my wristwatch. 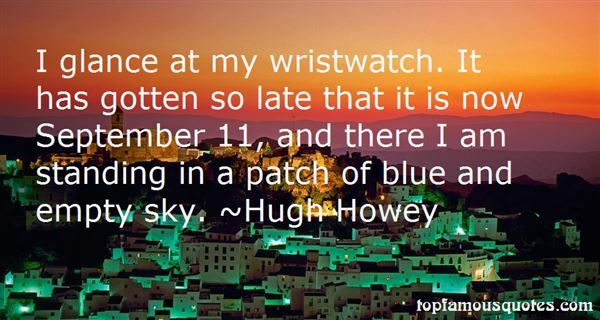 It has gotten so late that it is now September 11, and there I am standing in a patch of blue and empty sky." 21. "I am about to die. It is September 11, and every cell in my body is acutely aware of my looming demise. The certainty of it. The inevitability. Not years from now, not weeks nor days. Moments." 22. "It is a neglected but essential fact that we cannot appreciate the relationship between religion and violence unless we grasp the nature and meaning of the two partners in this relationship. Yet our understandings both of religion and of violence are inadequate. Further, we usually consider too few offspring of their troubled marriage: when we think of "religious violence," we tend to think only of holy war and (especially since September 11) religious terrorism. However, those are not the only types of religious violence." 23. "We can best honor the memories of those who were killed on September 11 and those who have been killed fighting the war on terrorism, by dedicating ourselves to building a free and peaceful world safe from the threat of terrorism." 24. "After the horrific attacks of September 11th, it was evident that our Government needed to be transformed to meet the new challenges of this dangerous world." 25. "Since the September 11 attacks, nearly 400 individuals have been arrested by the Justice Department as a result of ongoing investigations into international terrorism. Of that total, over half were convicted as a result of their actions." 26. "The September 11th tragedy forced us all to look at the world in a different way, and it reminds us all of the importance of living every moment." 27. "What we learned on September 11 is that the unthinkable is now thinkable in the world." 28. "This resolution is further proof that Congress stands firmly behind our troops and remains resolved to pursue those responsible for the terrorist attacks of September 11, 2001, until they are discovered, detained, and punished." 29. "If the events of September 11, 2001, have proven anything, it's that the terrorists can attack us, but they can't take away what makes us American -- our freedom, our liberty, our civil rights. No, only Attorney General John Ashcroft can do that." 30. "September 11 is one of our worst days but it brought out the best in us. It unified us as a country and showed our charitable instincts and reminded us of what we stood for and stand for." 31. "As the third anniversary of the September 11th attacks draws near we must ensure our nation is prepared to handle the continued threat of violence and terrorism on our country." 32. "The lessons of September 11 are that if we allow law enforcement to do their work free of political interference, if we give them adequate resources and modern technologies, we can protect our citizens without intruding on our liberties." 33. "If the first decade of the 21st century can be summarized in one scene, It will definitely be the collision of the two planes into the twin towers of the World Trade Center (New York) September 11, 2001, the scene represents the collision of the «mentality of the 7th century» that uses the «products of modernity» to attack modernity itself, in the 21st century within the heart of the city that is the capital of the modern world.?? ???? ????? ????? ????? ?? ????? ?????? ? ??????? ?? ???? ????? ????? ??? ????? ???? ?????? ????????? ????? ???? ??????? ??????? ?? (???????) 11 ?????? 2001? ???? ???? ????? ????? ????? ?????? ???? ?????? ?????? ??????? ?????? ????? ?? ????? ?????? ? ??????? ?? ??? ????? ?? ????? ?????? ???????." 34. "But through world wars and a Great Depression, through painful social upheaval and a Cold War, and now through the attacks of September 11, 2001, our Nation has indeed survived." 35. "On September 11 last year international terrorism entered a new dimension." 36. "After September 11, I got to understand a little bit of his deep love for this country." 37. "He was a son of the revolutionary movement when he and the revolutionary movement were still pristine. It was a special time for Filipino activists—a time when a hundred flowers bloomed and a thousand thoughts contended in a movement that did not know yet the price of betrayal from within. But flowers wilt and thoughts give way to rancor with the passing of years. And so some may grieve not his passing, while others fall to the ground in tears./FOR HORACIO BOY MORALES, JR. (September 11, 1943 – February 29, 2012)"
38. "September 11 awoke us to the threat of terrorism. It was forever bookmarked in our history as the day when life as Americans knew it, changed forever." 39. "Many of us saw religion as harmless nonsense. Beliefs might lack all supporting evidence but, we thought, if people needed a crutch for consolation, where's the harm? September 11th changed all that." 40. "What happened on September 11th is at least, theoretically, small stuff compared to what can happen." 41. "But since September 11, we have made every effort to try to work closely with state and local law enforcement." 42. "The men who committed the atrocities of September 11 were certainly not "cowards," as they were repeatedly described in the Western media, nor were they lunatics in any ordinary sense. They were men of faith—perfect faith, as it turns out—and this, it must finally be acknowledged, is a terrible thing to be." 43. "September 11 reinforced for me that whatever I'm writing about, it better be something that really matters to me because we don't know what's going to happen tomorrow. And for me it's stories about people in pain in New York." 44. "The public's evaluation of the job George W. Bush is doing as president changed dramatically as a result of the horrific attacks of September 11 and his response in leading the country on a campaign against terrorism." 45. "We must never allow September 11th to become a time for protest and division. Instead, this day must remain a time for promoting peace and mutual respect." 46. "Initially, the horrific images of September 11th triggered an enormous wave of solidarity." 47. "Those whose lives were lost on September 11 will remain in our thoughts and prayers forever." 48. "Mr. Speaker, on September 11, 2001, the United States was attacked, and Britain stood with us. This was not only an attack against America, but against the civilized world; and Britain understood this." 49. "I did not support any more New York. I lived 10 years there, and after September 11, I felt very European. I did not share the opinion of people in the street, who were deeply influenced by what they heard in the media." 50. "Before I begin talking about the threats we face, the vulnerabilities that we have, and frankly the courage of the men and women in uniform that stand in harm's way on behalf of a very grateful Nation, let me first honor the sacrifices of September 11." I sacrificed for the Dallas Cowboys when most quit. I put in overtime to try to help young players."